I have been using Musical Futures officially for two years but prior to that I taught in a very MF kind of way. Can’t remember the last time I played Vivaldi’s 4 seasons in the classroom. On prac probably. I teach at Kolbe Catholic College, Rockingham, Western Australia – I have been there for 8 years. 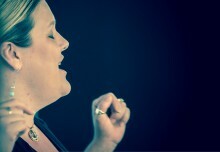 Previously I taught in the UK from 1996 – 2005. I did a traditional classical music degree (academic, not performance), which has very little to do with any musical activity I do today. I’ve played in brass bands for the last 15 years, on a variety of instruments but I also play clarinet, sax, piano (supposedly my first study instrument), and guitar, ukulele, bass and drums. I play drums in our local Salvation Army church when I’m not playing the euphonium. I’ve written heaps of music for children over the years, ranging from individual songs to whole musicals, and in the past I’ve conducted community choirs and arranged music for them. 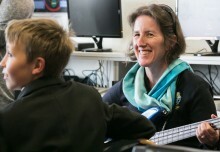 I’m hugely passionate about making participation in music making available to everyone, so my classroom has always been about getting in there and playing stuff. Even my instrumental teaching (brass and piano) is about getting students to be able to play in an ensemble setting as soon as possible, and that often means tailoring parts to suit what they can play now, rather than making them wait until they’re ‘good enough’. 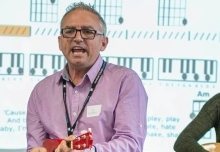 Last year I completed an MA in Music Technology – the focus of my thesis was how to incorporate music technology in the classroom to improve student engagement. I wrote a series of interactive textbooks for use on iPads to allow teachers and students to use technology. I have used these in my Musical Futures lessons to allow students to create their own backing tracks for songs we do in class, and to improve their instrumental skills by coming in at lunchtime and working through activities themselves. 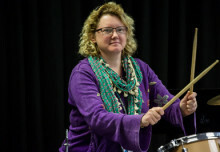 I’ve been developing ways to allow students who play traditional instruments (flutes, clarinets, trumpets and trombones mainly) to integrate into a Musical Futures classroom – otherwise they get jealous when all the kids who don’t have instrumental lessons get to play Uptown Funk in class while they’re still doing Merrily We Roll Along with the woodwind teacher. This has been great – a real success was taking the Funky Jam from Just Play and having the trumpets and saxes playing the melody or the bass riff. I’ve done this with many other songs and its great. I can’t do 5 words – 6 is the smallest. ‘Getting in there and playing stuff’. Or ‘Everyone gets to be in the band’. In the last hour or 2 I’ve listened to Kate Rusby’s ‘Underneath the Stars’ album, the first movement of Betthoven’s 3rd, and Superstition by Stevie Wonder (to make a classroom arrangement of it for Year 9).